Vine leaf water potential (LWP) is an indirect measure of vine water status that is usually monitored weekly prior to the onset of irrigation. LWP is most accurately measured with a pressure chamber device. Units of LWP are negative bars or megapascals (MPa). As plant stress increases, LWP readings will decrease (become more negative). Fully irrigated vines under very little water stress typically have LWP between -7 bars (-.7 MPa) to -10 bars (-1 MPa). LWP is often used to determine when to schedule the first irrigation of the growing season. A pre-determined LWP threshold is selected, and the first irrigation is applied when LWP approaches the threshold. Commonly used LWP thresholds vary by variety and other factors with lower thresholds (-14 to -15 bars) for red winegrapes than for white winegrapes (-10 to -12 bars). The publication Using a Pressure Chamber to Monitor Leaf Water Potential in Winegrapes details accurate measurement of LWP for scheduling the first irrigation of the growing season. PMS Insturment company is one manufacturer of pressure chamber devices and has an excellent picture tutorial for measuring LWP in winegrapes on their website. 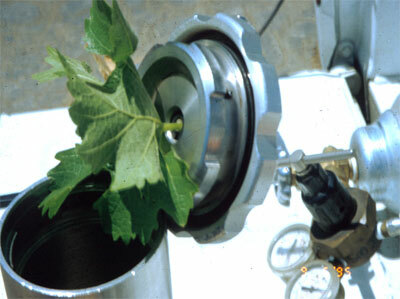 A grapevine leaf being placed in a pressure chamber device.